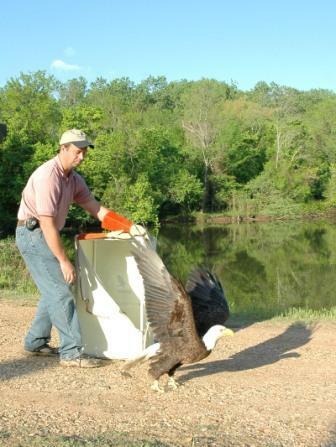 On Friday, April 21, our Bald Eagle was ready for release and we took him back to the Six Mile Creek area - his home near Scranton, Arkansas. Tagging along with us were several photographers, including one from Russellville's newspaper, The Courier. We chose a beautiful spot on Water Plant Road which had a good vantage point for the bird and for his audience. 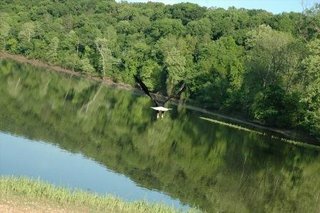 As Dr. Davis opened the carrier, our eagle made no haste in jumping out as quickly as possible and s oaring over the water while we all gasped in wonder. His flight was strong and marvelous. The joy we all felt was indescribable. Just watch the video yourself! (warning: 4.84 mb download) Now, THAT's what it's all about!! !